My latest koshirae project for our collection: doeskin tsukamaki & samegawa saya, with Mid-Edo Period (ca. 1720-1760) silver fuchi, kashira & tsuba... This is part of a Daisho (matched set) that I am putting together. This is a gendaito signed Nagamitsu (長光), dated "lucky day in April, 1937." The tsuba & fuchi/kashira are all Edo period, and have matching daisho sets. 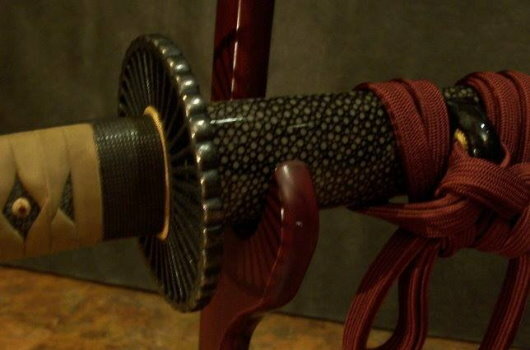 Both tsuba are silver/shakudo; the katana tsuba is signed Nobuie (信舎), but the smaller tsuba is mumei. The dimensions of the koshirae/sword are: overall length is 40" (101.6 cm); tsuka is 10" (25.4 cm); and, the sword blade 27.5" (69.85 cm).